“The temple was a special place. There was the smell of moss and incense, and sounds, too–you could actually hear the insects and birds and even some frogs–and you could almost feel the plants and other things growing. We were right in the middle of Tokyo, but it was like stepping into a pocket of ancient humid air…that’s the way the temple felt to me, like a core sample from another time…” (46). “The past is weird. I mean, does it really exist? It feels like it exists, but where is it?And if it did exist but doesn’t now, where did it go?” (97). “Life is fleeting! Don’t waste a minute of your precious life! As I read the novel, I felt like I could relate to so much of what was written–I’ve felt what Nao describes whenever visiting temples in Japan, I’ve wondered about how the past sometimes feels like a dream, and I often try to “wake up” and be a positive part of the world. “A wave is born from deep conditions in the ocean,’ [Nao’s grandmother] said. ‘A person is born from deep conditions of the world. A person pokes up from the world and rolls around like a wave, until it is time to sink down again. Up, down. Person, wave” (194). On their picnic, one of the things they bring along to eat is onigiri, or rice balls. 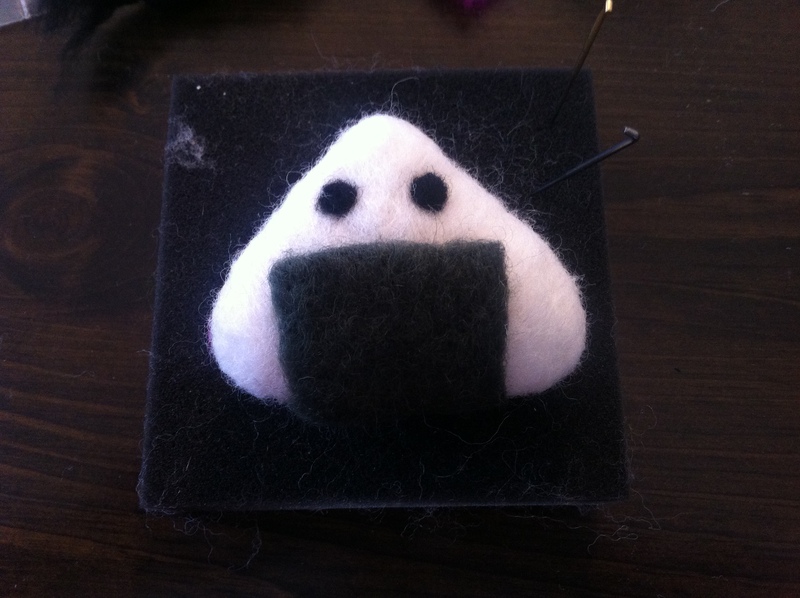 So, I made an onigiri needle felt! 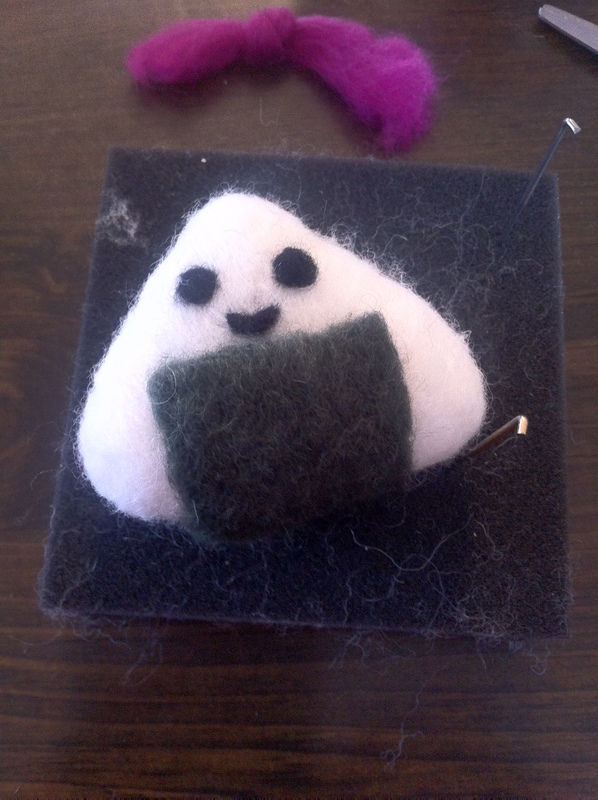 Let’s Make a Needle Felted Rice Ball! 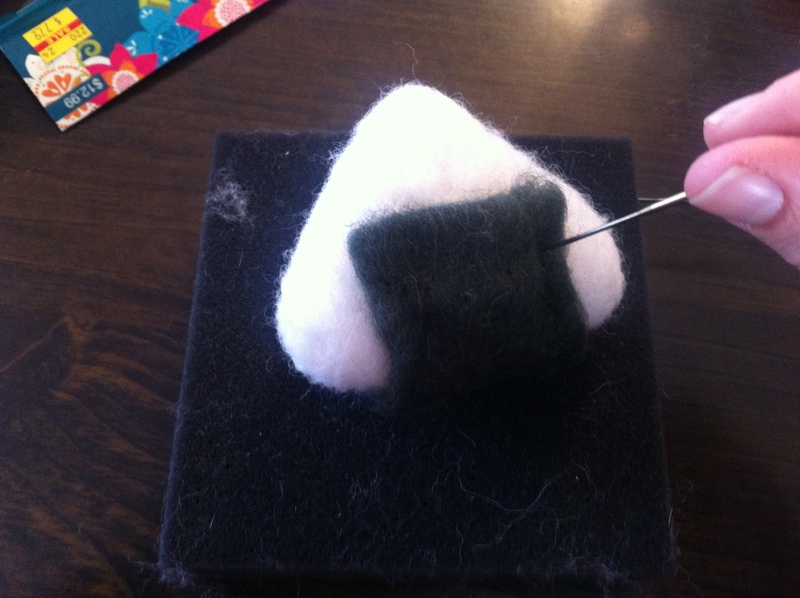 Gather your supplies: a foam block, 36 and 38 gauge triangle needles, and felt in white, dark green, black and pink. 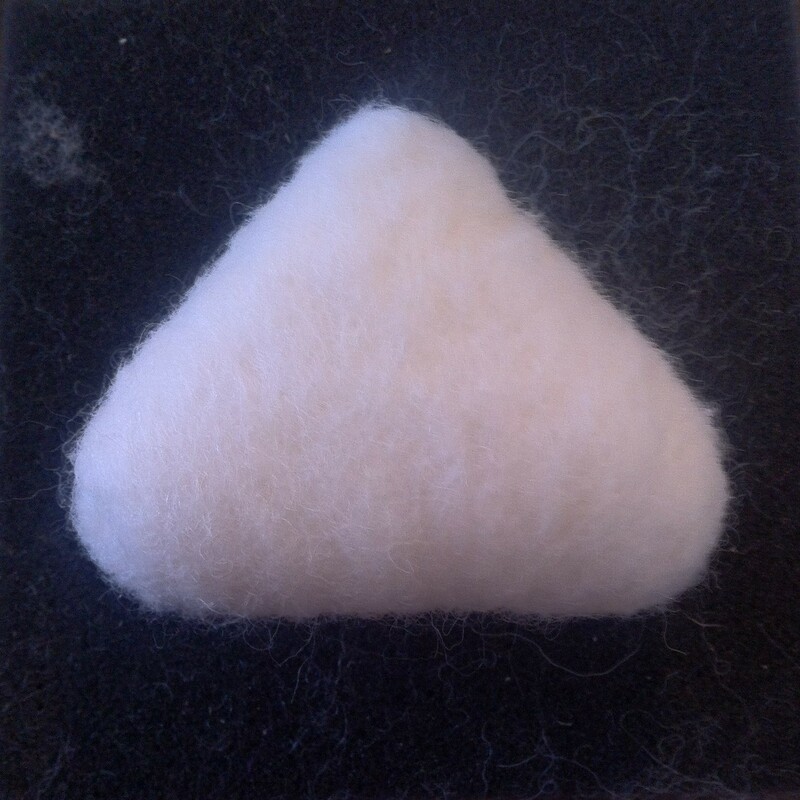 Then set some white felt flat onto your foam block before rolling it into a triangle shape and poking it with your 36 needle in every direction as you go. 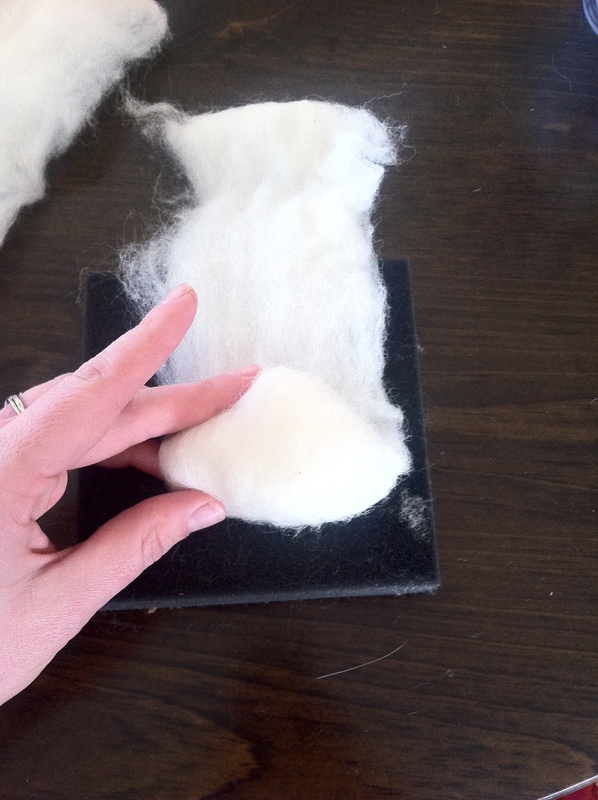 When you reach a thickness you like, spread out the felt so it can be blended in with your needle so that no lines are showing. Keep poking all around to make the triangle an even shape. Once you’ve gotten a seamless shape that you like, you can adjust as necessary with your needle to round the edges more to make them cuter. Then go over the triangle with your 38 needle to smooth it out. Next you’re going to add nori, or seaweed. Pull off a piece of green foam about half the width of one length of the white triangle, and long enough the wrap around the triangle with room at the top on either side. 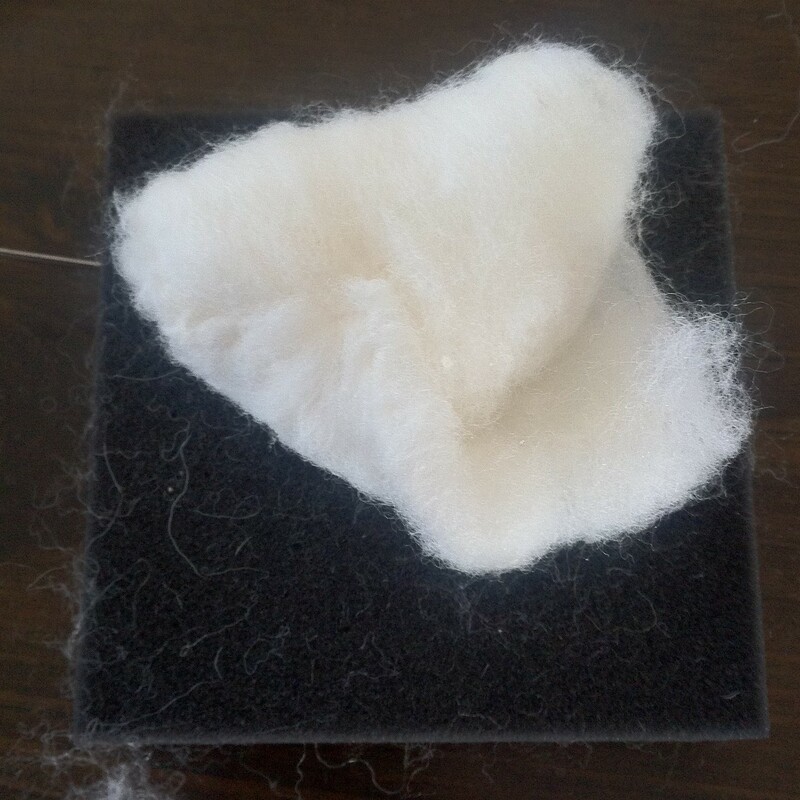 Then use a toothpick to wrap the edges of the green foam so they are clean and not fraying, poking the felt with your needle as you go to keep the felt in place (and pulling out the toothpick each time). After “cleaning up” all four sides of the nori, it’s time to attach the seaweed to the rice ball! Position the seaweed so that there is enough room at the top of the triangle to add the face, and then poke with your needle all around to secure. 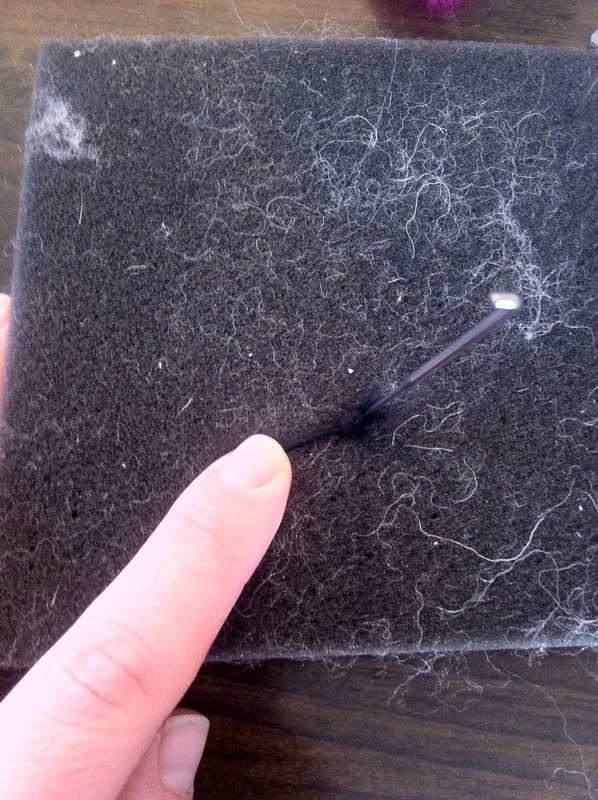 Next, cut off two small bits of black felt and roll each one into a tiny ball. 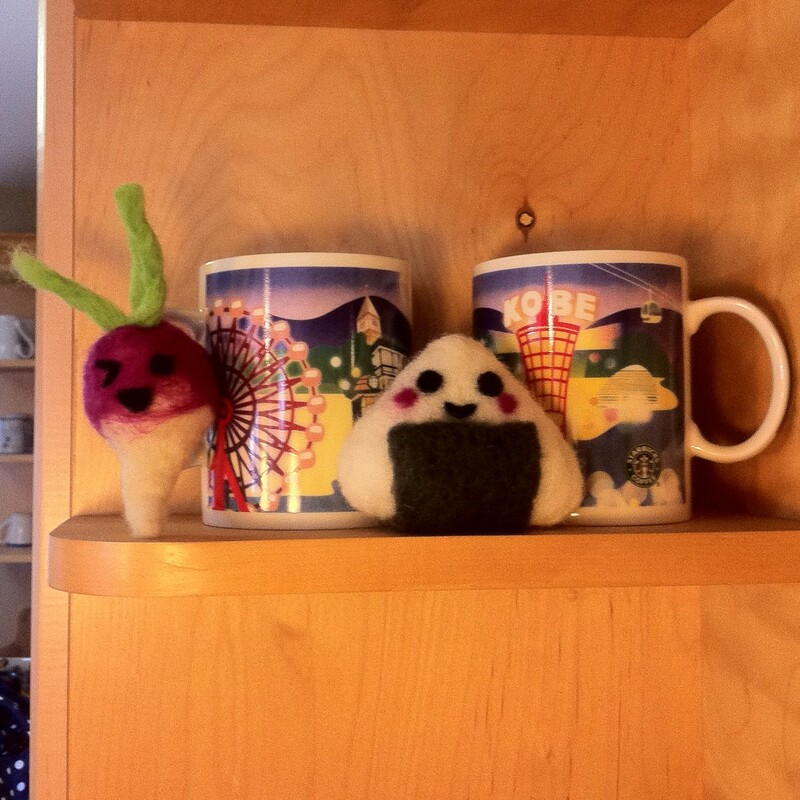 Secure the little balls to the rice ball to create eyes. 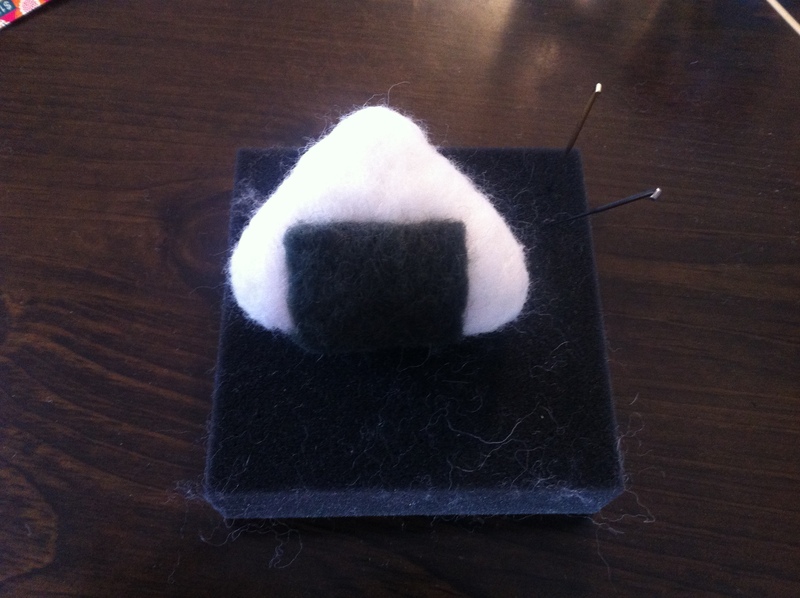 To make the mouth, cut off another piece of black felt, and roll it into a thin line. 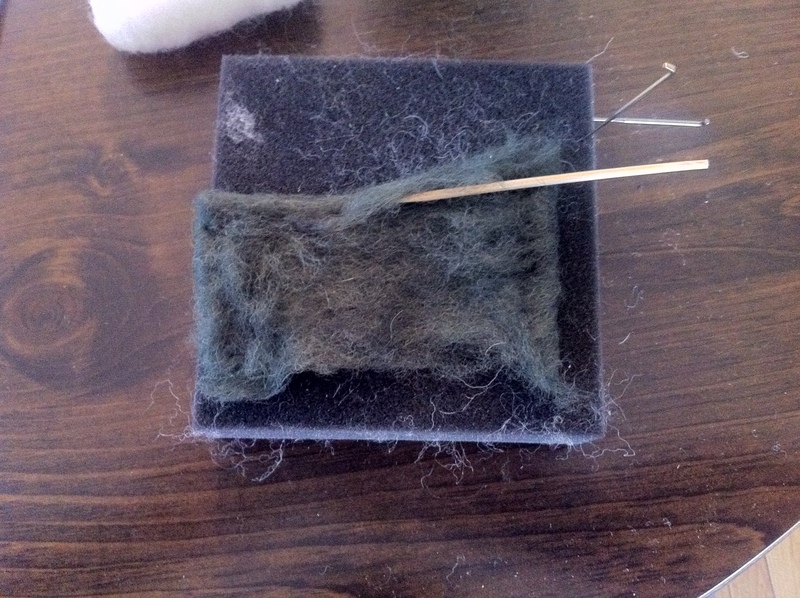 I rolled it tightly and secured one end of the felt with my 38 needle while poking the felt all around (twisting as I did so) with my 36. Secure the mouth to the rice ball, adjusting over several minutes to form it into a smile. 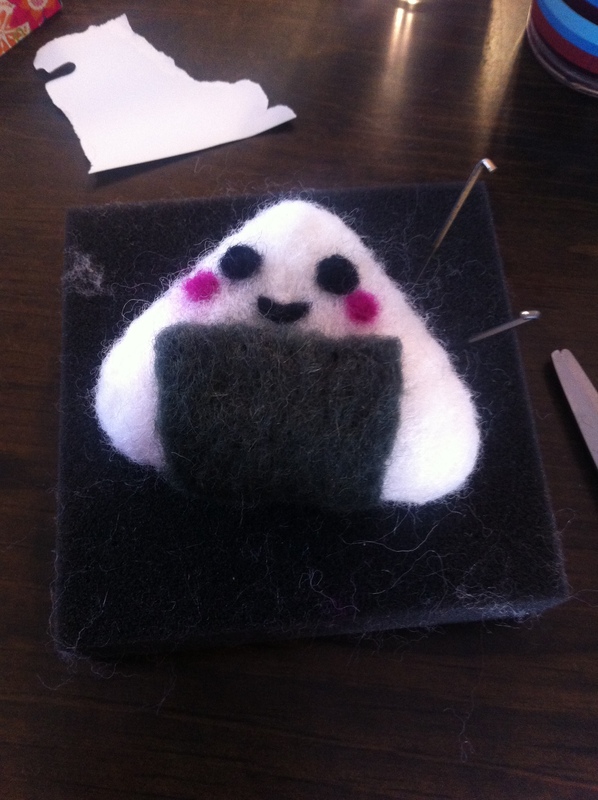 Lastly, roll two small balls of pink felt and added them for cheeks. 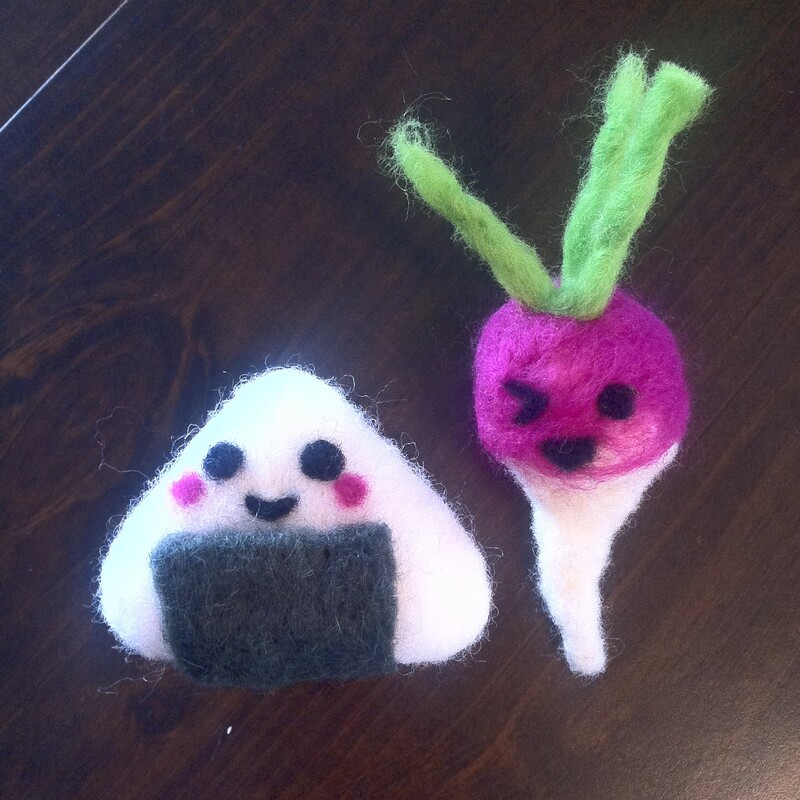 After going over my rice ball and tucking in flyaways with my 38 needle, I put him next to the radish I made for company! *I’ve decided to start a bookspiration series sporadically throughout some new posts that use books as inspirations for crafts and recipes. I hope you enjoy the posts! Thank you! Yeah, I love whimseybox!